Mobile, top model for IT departments, archives or as a central shredding point. Also suitable for shredding CDs and floppy disks. The sturdy technology has been especially designed for a large throughput and long total operating time. Integrated, manual oiler for cutting unit (particle cut version only). 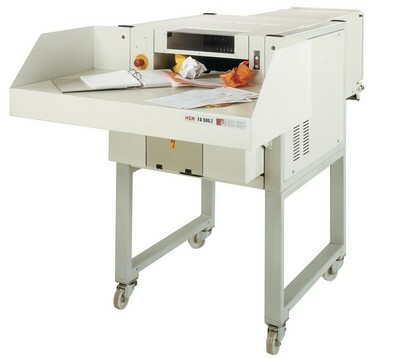 Material intake via loading table and electric conveyor belt. Stand-by mode with LED indicator. Keypad control for constant operation and reverse. Automatic stop and reverse in the event of paper jam. Shredded material transported out of the cutting unit by a conveyor belt. Made in Germany.